Introducing the 2015 Subaru XV Crosstrek. The most efficient Crosstrek yet. Subaru’s compact crossover will be available at Budds’ Subaru this January with more standard performance, safety, and comfort features than ever before. All trim levels will come with the new ultra efficient and emission-friendly PZEV engine. Quite simply this engine saves fuel while saving the environment. The XV Crosstrek Hybrid will use the same engine. It will; however, add an electric motor linked to a hybrid CVT transmission to take fuel efficiency to another level. The XV Crosstrek will deliver fuel economy figures of 9.1 L /100 km city and 7.0 L /100 km highway (with CVT) and 7.9 L / 100 km city and 6.9 L / 100 km highway (with electric hybrid motor). A rear-view camera will now be included on every trim level alongside Subaru standard safety features such as front dual-stage airbags, driver knee airbag, front seat side-impact airbags and side curtain airbags with rollover sensor. 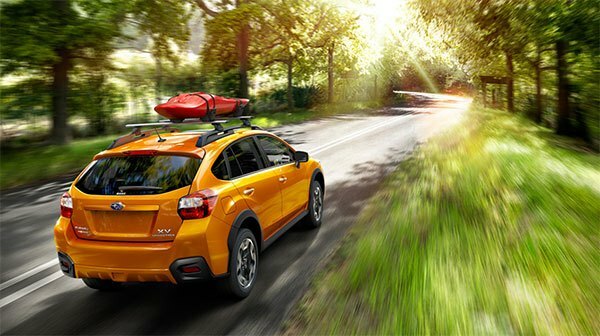 For the first time, Subaru’s preventative safety system, EyeSight, will be available for the Crosstrek. The previously mentioned PZEV rated engine is the 2.0 liter Subaru BOXER engine. It supplys 148 horsepower to symmetrical full-time All-Wheel Drive via a five-speed manual transmission or an available second-generation Lineartronic Continuously Variable Transmission (CVT). The refined CVT has pre-programmed stepped shifting, making the vehicle feel even sportier and providing an impression of gear ratios. An electronically managed continuously variable transfer clutch actively controls torque distribution in response to driving conditions and wheel slippage. Inside, Subaru has significantly upgraded all infotainment and technology features. The audio system found in the XV Crosstrek Touring, Sport and Hybrid models offer an AM/FM stereo with SiriusXM satellite radio, Radio Data Broadcast System, in-dash CD player, 6.2-inch multi-function touchscreen display, Subaru STARLINK connectivity with Aha smartphone integration, Bluetooth hands-free phone connectivity and audio streaming, iPod control capabilities, a USB port and an auxiliary input jack. The upgraded infotainment system in the XV Crosstrek Limited Package includes a 7-inch touchscreen navigation. This unit offers swipe and scrolling gestures, similar to smartphones and tablets, as well as voice-activated SMS text messaging and iTunes tagging capabilities. An integrated voice command system accepts natural language and phrases and also operates the dual-zone automatic climate control system. We will have more details for you, including pricing, in the coming weeks. Thank you for your interest! Click here for a complete overview of the Crosstrek.